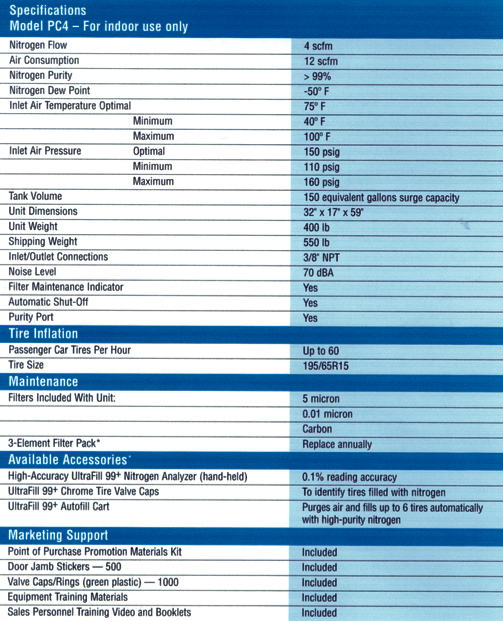 Our UltraFill99+ Nitrogen System provides the highest purity Nitrogen for tire inflation presently available today. At a price more competitive than larger, less efficient Nitrogen systems being sold. Higher purity Nitrogen allows greater concentration in the tire in less time. Further, the UltraFill99+ System provides twice the continuous operating capacity as other systems, thus enabling a system to support multiple service bays. Versatile and Compact, it has a large self-contained 150 gallon storage unit, advanced technology that translates to superior performance. UltraFill99+ installs very easily and is simple to operate. Read more about the UltraFill99+ System at www.UltraFill99.com.